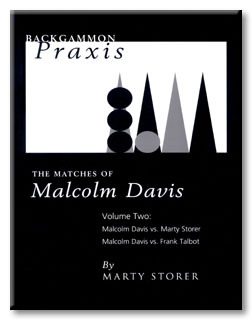 Backgammon Praxis is a two-volume set containing detailed analyses of three matches played by Malcolm Davis, one of the most successful tournament players of all time. Each interesting position in the matches is illustrated and discussed. A unique feature of the book is that many alternate plays are also illustrated and discussed in considerable detail. Snowie 3.2 was used to provide evaluations and/or rollouts of the positions. See Storer's preannouncement of the book here. The website has PDF samples of the introduction and first game. "These books are a must have for any student of the game. They use diagrams very liberally, not only showing the continuation of the game, but illustrating the alternatives he discusses. Marty does a great job of including bot evaluations and rollouts in his analysis. And he conveniently presents these tables right along side his analysis, so you're not constantly fumbling through the appendix to get at them. Ed O'Laughlin, Frank Talbot, Marty Storer, and Malcolm Davis. AUTHOR: Marty Storer is an avid analyst and was once an avid player. He's been playing since 1975 and is fond of nostalgic reminiscence about the quaint style of the Good Old Days. He won the first American Backgammon Tour in 1993, and by 1995 he was ranked 13th on Kent Goulding's International Rating List. He's now in semi-retirement from tournament play: "One big tournament a year if I'm lucky," he says wistfully. He compensates by analyzing matches, far past midnight in his cluttered study. Where is he at this moment? Above in the digs, chattering at his pet bots, JellyFish, GNUBG, and Snowie. His other passion is anagramming. There are anagram-bots, but Marty would die before calling on them for help. "They're better at calculating, but I'm more of an artist. I know the language better than any bot," he observes. His magnum opus anagrammicus is Lo, Martin's Pen Mashes O.J. : A Murder Mystery in Sequenced Anagrams. He hopes someday to arrange a challenge match against the anagrammist, backgammon superstar, and Scrabble guru Nack Ballard. Marty's day job involves leading a team of fine software engineers, a task that has been likened to hearding cats. When he's not engaged in his shepherding duties, Marty can occasionally be glimpsed in online backgammon forums, or as mws on FIBS. He lives in the New Hampshire flatlands, new England, USA, with his wife, three children, dog, and two cats.